But sleepovers don’t have to be like that if you just get a little fancy with them. So without further poor storytelling… wait, come on, one more? Please? OK, real quick. This one time, I went to the beach with my good friend Mike and we went to a party at a beach house with all of his friends, and he had to sleep on this tiny corner of a pull-out sofa (read: not fancy) with two girls (read: no three-some, no two-some) while I ended up falling asleep in the king in the master bedroom that had it’s own bathroom, complete with 6 AM supply of Ibuprofen, and wide-open French doors that let in a cool mist of rain that soaked the floor, but kept me refreshed (deep breath! ), and it was the best. So yeah, sleepovers are awesome if you remember the key. The key is to keep it fancy! That is always the key. Now let’s get started. The first question everyone wants to ask is, clothes? How can I be fancy in bed? Don’t ask Victoria’s Secret, that isn’t fancy enough. Ask Google. 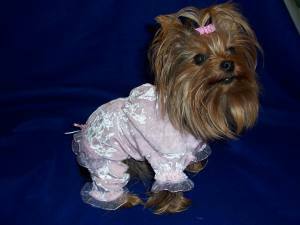 Go ahead and Google fancy pajamas, and this is what comes up. Ummmm. Right. Yes. Bearded dogs. Let’s, uh, move on. On to the HAMMOCKS!!!!!!!!! THEY SWING! 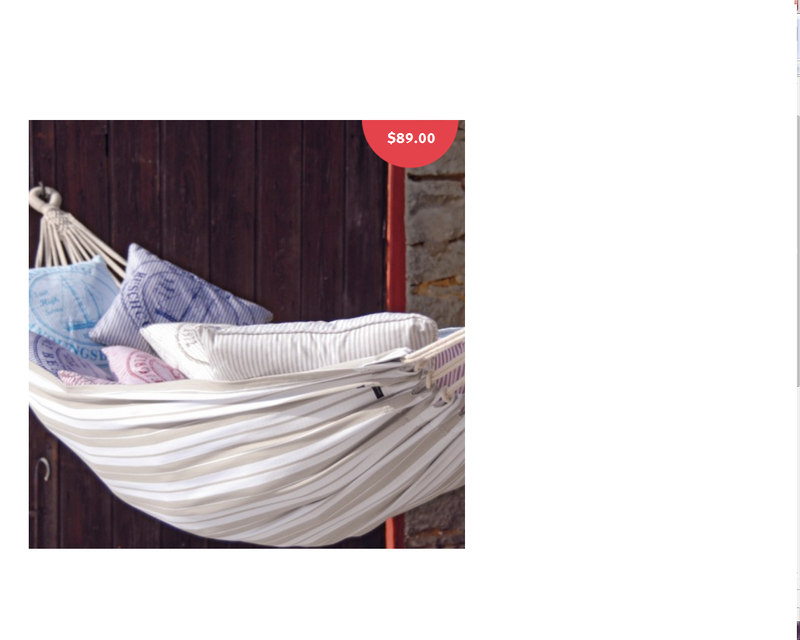 They are perfect for 2-person sleepovers. You need three people, though. Here’s what to do: Climb into your hammock, make room for the other person (gosh, move over, fattie) and ask the third person to give you a nice push and maybe turn on your make-out playlist. Now you’re solid. If your sleepmate becomes a jerk, in the hammock or elsewhere, it may be time to leave. But there’s no need to be rude in return. 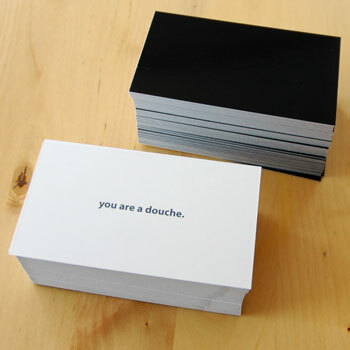 Common courtesy demands that you let this jerk know why you left, so be sure to leave behind a douche card! Place it on the pillow, tape it to his/her forehead, glue it to a mirror – just do what you gotta and make sure they know they are the problem. Miss Manners is proud. Like an Ostrich! What? OK, sometimes you may be at work and it will be 2 PM and you will be on a conference call and you will close your eyes and lay your head on the desk and think, “Maybe I listen better with my eyes closed. Or maybe I just need a sleepover at work. 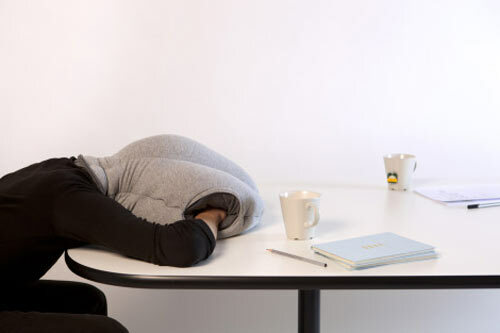 Why is my desk so terrible to sleep on?” Well, my fancy friends, you can sleep in peace at your desk with your fancy ostrich nap pillow! You may look ugly, but you will sleep in peace. Fo sho. SECOND BONUS! This thing looks like a big punching glove, and that may miraculously come in handy some day when you are lugging it to the airport, or any other fancy place you may wish to have a sleepover. I’m not sure how. You can figure it out. Finally, sleepovers are best with fancy breakfast the next morning. 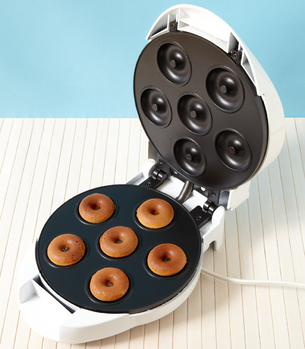 But you won’t have to run to Dunkin’ for a tasty treat if you own your very own mini-donut maker! But really, mimosas are the fanciest sleepover breakfast you can have, so maybe just go out, buy a $6 bottle of champers, squeeze an orange, and skip the donuts. This post is brought to you by Rachel, who prefers mimosas to donuts any day. RACHEY: in my defense, that asparagus was annoying. i forgive, i just can’t forget.